When visiting Scotland kilts are one of the first things you would expect to see. And you wouldn't be disappointed. Go to any Highland Games, there you will see a vast array of Scottish kilts, and they are not only worn by the competing athletes, and the various pipe bands, but also many of the spectators. Such an event is not to be missed, if you can fit it into your visit to Scotland, and it gives you the chance to see many different tartans being worn. Scotland has so many attractions, that it would be almost impossible to attempt to list them all. But there is one that I wholeheartedly recommend, and it is the Edinburgh military Tattoo. This event is one of Scotland's premier tourist attractions, and features military pipe bands from around the world, and so much more. 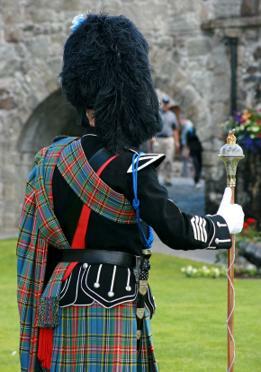 I have included a photo of a pipe major, which you can see below. The kilt of course is world famous, I doubt there is another National Dress that is as well known. The history of the kilt goes back to at least the end of the sixteenth century (possibly further), and its appeal is growing ever stronger as the years unfold. Below you can see a photo of Alex Cunningham and the Laird of Fairntosh, with Edinburgh Castle in the background. They are about to take part in a kilted walk for charity, and as you can see, are both suitably casually dressed in their kilts. And as you know its popularity is not confined to Scotland, kilts in fact can be seen in many countries around the world. They are particularly popular in North America, Canada, New Zealand, Australia, and South Africa, to name just a few. The reason for such interest lies in the fact that these countries have large numbers of Scottish descendants, many of whom are very proud of their Scottish heritage, and as such love to wear their kilts. But having said that, please don't think that you have to have Scottish blood running through your veins to be entitled to wear a kilt. 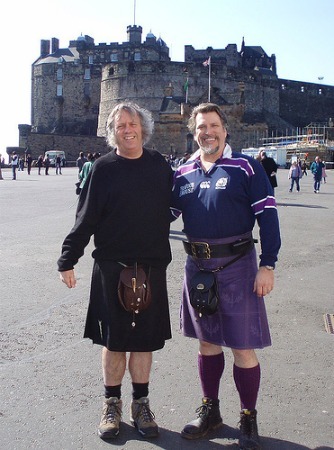 Many thousands of people who have no obvious family connection to Scotland, or any other Celtic country for that matter, nonetheless choose to wear the kilt at every opportunity. The reasons for this are plenty-full, the kilt is after all one of the most elegant and stylish garments imaginable, it is both incredibly comfortable and versatile, and you can wear it to just about any occasion you can imagine. The next photo emphasizes this point, you can see the young man dressed in a very striking tartan kilt, the tartan is called Dalrymple. When you wear full Highland Dress, you are ready to attend the most formal of occasions. 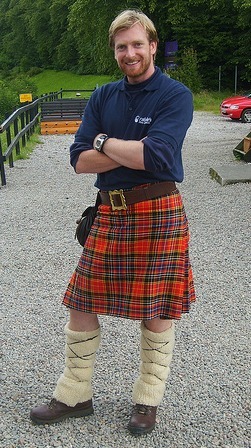 At the other end of the spectrum, in Scotland kilts are often seen being worn in a casual setting, as in the photo above, this is also true in many other countries. So if you have never worn a kilt, but feel that you would like to experience something totally different, my advice, the next time you are invited to a wedding or some other formal occasion, rent a kilt outfit and make a real impression. Having worn one once, you may well experience an overwhelming desire to go out and buy one, you wouldn't be the first.